These are medium size shrunken heads. These are reproduction shrunken heads made by the Jivaro Indians in Ecuador. They are made using goat skin and hair or llama hide and hair instead of real human heads. Each one is unique. Antique real shrunken heads usually sell for US$50,000 to US$60,000. 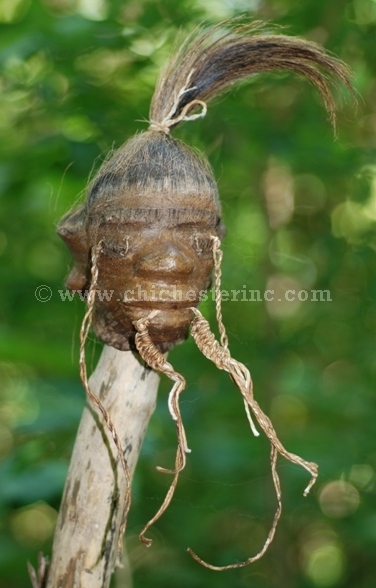 See www.head-hunter.com/tsantsa.html for more information about shrunken heads. Goat: Capra hircus. Ranch. Stiffer hair and thinner skin. There are no export controls for this item. Llama: Lama glama. Ranch. Softer hair and thicker skin. A USFWS export permit is required for all shipments outside the U.S.
No exports to France or Italy due to local import restrictions. Goat and llama are not endangered species and are not subject to CITES controls.